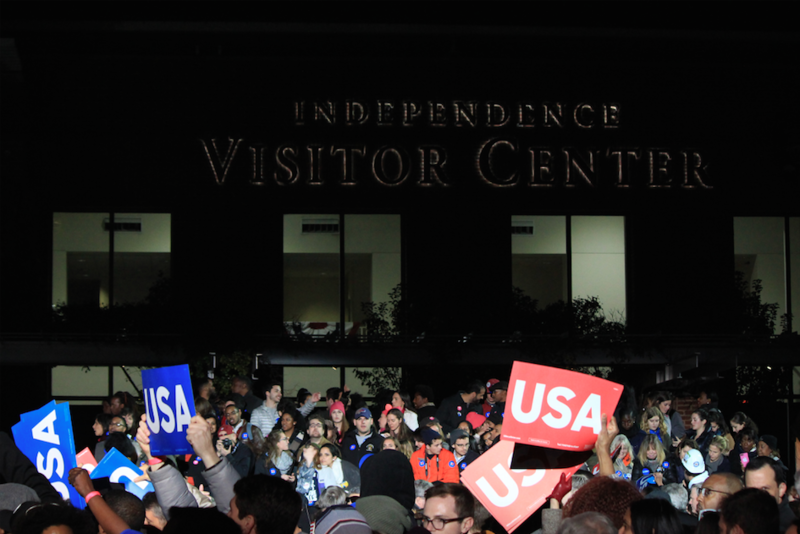 Tens of thousands of people came out to see President Obama and Michelle and the Clinton family last night at Independence Mall. Oh, and Bruce Springsteen and Bon Jovi were there, too. The line was nearly two miles long, according to Billy Penn, but people still waited hours to see the Democrats and their celebrity campaigners. Bon Jovi and Bruce Springsteen played for the crowd until the speakers arrived, and between songs, each reminded the crowd of the reason they were all there. “Hillary Clinton has proved to be a unifier,” said Bon Jovi. Jovi sang four songs and read a statement from a Republican, Catholic male from Philadelphia who decided to cross party lines and consider Hillary Clinton. Before Jovi left the stage he reminded the crowd of tomorrow’s importance. Springsteen came up on stage shortly after Jovi and also shared his faith in Clinton. “The choice tomorrow couldn’t be any clearer,” he said. 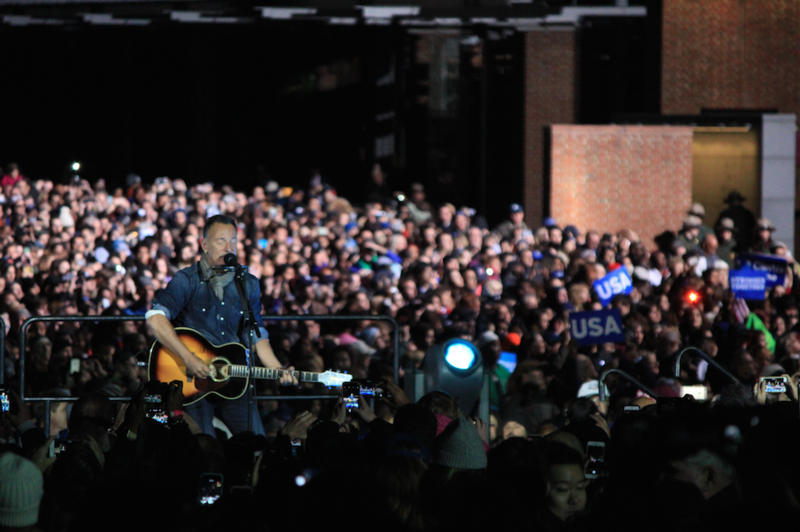 Springsteen sang a prayer post-election song before he exited the stage and the crowd anxiously waited for the Clinton’s and Obama’s to come out. The Clinton family then appeared on stage and daughter Chelsea Clinton spoke about her gratefulness for being able to travel alongside by her mother the past couple months during the election. “I cannot wait to cast my vote for her,” said Clinton with a big smile. Bill Clinton then spoke very briefly. “You just saw one of the reasons why you should vote for her,” he said, referring to his daughter boasting about his wife. Clinton then proudly introduced First Lady Michelle Obama onto the stage. Her speech was longer and more passionate but still held the same significance. “We are one day away once again from making history,” said the First Lady, reminding the crowd of the historic significance of her husband’s first presidential victory. She kept pressing into the crowd the power we have as citizens when it comes to voting and making decisions that will not only have significant effects on our country, but also on a global scale. She reminded us of the results we could face if Clinton’s opponent one. Several speakers mentioned Trump and reminded the crowd of the danger and divisiveness he poses, but the rhetoric altogether was positive and inspirational. “I am here tonight because I believe with all my heart and soul that Clinton is that leader,’ said the First Lady. She then brought out her husband, Barrack Obama, to the crowd’s roaring. Obama talked about his time spent with Clinton in office and how she was always prepared and would never let anyone push her around. He compared Clinton’s strength to that of the American people. He doesn’t want them to vote for Trump, but he also wants the people to realize the opportunity they are given in voting for Clinton. “I have bet on you before America, and I am betting on you one more time,” Obama said. The crowd roared when they realized that Obama’s statement was leading up to the introduction of Hillary Clinton. Soon enough she was brought on the stage while the crowd chanted her name. 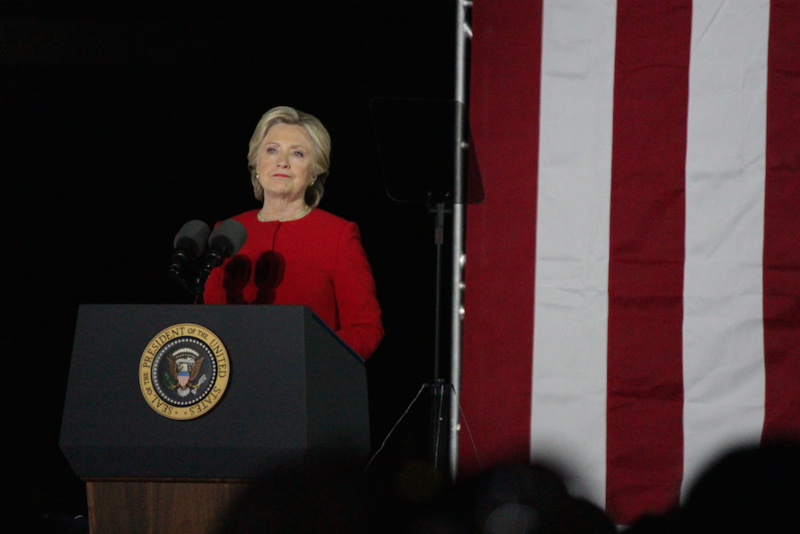 Clinton smiled and thanked the audience for their patience and dedication. She thanked her husband and daughter for being there by her side through everything. She thanked the Obama’s for having the privilege to work with them and having them go out there and present powerful speeches on their support for her. “I am happy to be here tonight. Every single one of you and everyone you know should vote,” she reminded the crowd. Clinton began her speech by claiming the election choice was clear when it came to division versus unity. She argued that with her as a leader, the country would continue to progress. While Clinton spent a large amount of her speech confidently stating how the country would benefit under her presidency, she also brought up an important reminder about Captain Khan. She reminded the crowd how Captain Khan’s father, Khizr Khan, questioned whether his son would have had a place in a Trump world. Going off of the heroic story, Clinton then continued her speech about how generations of Americans have come to meet the test of their time. Every issue we care about is on the ballet’s when we vote tomorrow. “I believe we all have a role to play in building a better and stronger America,” she concluded.